The poppies bloom in Spring and sometimes in Autumn when the weather is warm enough. Poppy flowers may be almost any colors, are attractive and most are cultivated as ornamental garden plants, as sources of drugs (opium is extracted from them) and foods (poppy seed are used in cooking and baking). Who doesn't like their intense color? These days, in Canada, the poppies are blooming at people collars like never before. I was pleasantly surprised to see that Vancouver's streets are spotted with so many good-looking red poppies “walking on the streets”. The poppy as a symbol of remembrance, is used internationally to honor those who have paid the ultimate sacrifice for their countries. The association between poppy and how battle fields exploded with the blood-red flowers after the fighting ended was since the Napoleonic wars in the 19th century. In Canada the poppy was adopted as symbol of Remembrance since 1921 and the person who was responsible for this was Lieutenant Colonel John McCrae, a Canadian Medical officer during the First World War who recorded this phenomenon in his famous poem "In Flanders Fields". It is traditional to wear a Poppy on the left lapel and as close to the heart as you can starting on or around October 27th till November 11th (the official Day of Remembrance being November 11th). Look for the new commemorative 25 cent Poppy circulation coin from the Royal Canadian Mint, in your change. Maybe some remember that the 2004 Canadian "poppy" quarter was the world's first colored circulation coin. Let’s wear a Poppy again this year to pay tribute to all soldiers from all wars that have fought for freedom and pause in united silence for two minutes. 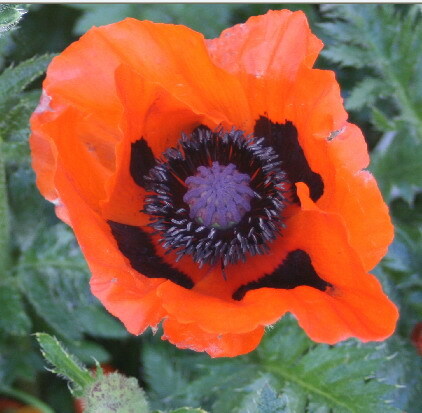 Beautiful photos of poppies. Just my red spring series was inspired by a field of poppies with green covers red. Saludos. I had no idea that poppies were a symbol of remembrance, I just thought they were beautiful!